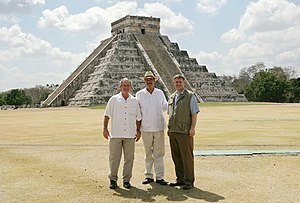 Former U.S. President George W. Bush, former Mexican President Vicente Fox and Stephen Harper, right, at the Chichen-Itza archaeological ruins in 2006 (Photo credit: Wikipedia)Hello. My name is Kevin Annett – Eagle Strong Voice, and I am the chief consultant for the Prosecutor’s Office of the International Common Law Court of Justice. Today is Monday, October 15, 2012, and marks the formal online convening of the five sworn judges of our Court, from Canada, the United States and Belgium. They are joined by fifty eight sworn citizen jurors from Canada, the USA, Ireland, England, Holland, Italy and Australia, who have been prepared to receive the evidence in the first of five cases in the Docket of our Court. This first case involves the evidence that the government and churches of Canada entered into a criminal conspiracy to commit genocide and other crimes against indigenous people and their children for over a century; and that such crimes were committed by the defendants and their organizations, and continue today. Thirty two officers of church and state have been issued Public Summonses by our Court to reply to these charges, and only one of them, John Milloy, has replied. Neither Mr. Milloy nor any of the other summoned parties have contested or denied the charges made against them, including Pope Benedict, Queen Elizabeth and Canadian Prime Minister Stephen Harper. Our Prosecutor’s Office has therefore filed a motion with the Court that a guilty plea be entered on behalf of all of the defendants named in our Summonses, in their absence, since they do not contest or deny the charges made against them. The aim of our Prosecutor`s Office is to achieve a final verdict of guilty against all of the persons and organizations named in our Public Summons of September 21, which is posted online at http://www.itccs.org . For the record, our Office will demand the strongest sentences against these parties, including extensive prison terms, the expropriation of their property and assets, the citizens’ arrest of their accomplices and others engaged in these ongoing crimes, the occupation and seizure of catholic and protestant church property, and the legal and practical dis-establishment of the criminal church bodies named in the main indictment. These sentences will be duly enforced by our own sworn Common Law Peace Officers and regular law enforcement officers deputized by our Court. The defendants will not buy their way out of responsibility for the deaths of children and these other crimes against humanity, as they have up until now. Nor will they and their organizations be allowed to terrorize the innocent any longer. The volume of evidence gathered against the defendants is considerable, comprising nearly two hundred exhibits that will be presented as primary evidence by our Prosecutor`s office in the course of our argument. For this reason, it is necessary to present the evidence as a single package, and not in piecemeal form, so that the citizen jurors and the public can receive the most accurate and truthful presentation of the evidence of genocide in Canada. Accordingly, and for the sake of the judicial and historical record, it has been decided by the Court’s Panel of Judges to allow our Prosecutor’s Office until Thursday, November 1 at 5 pm Greenwich Mean Time to compile all of our exhibits and evidence in a condensed, viewable form, and to commence their complete presentation to the Court at that day and hour. This presentation will be posted that same day on You Tube, google video and http://www.itccs.org . I am therefore authorized to announce that the Prosecutor’s Office of the International Common Law Court of Justice will commence our opening argument and presentation in the first case in our Docket, The People and Kevin Annett v. the officers of the government of Canada, the crown of England, the Vatican and other church corporations, on Thursday, November 1, 2012 at 9 am pacific time, 12 noon central, and 5 pm Greenwich mean time. The duly sworn citizen jurors will hold themselves ready to convene on that day and hour. And you, the public, are invited to join us that day and view the online evidence in this historic court of justice. This entry was posted in News Archive and tagged Canada, Common Law, Court, Crimes of Church and State, genocide, hypocrisy, John Milloy, Kevin Annett, Stephen Harper, United States, Winnipeg by renaissancelearningfoundation. Bookmark the permalink.